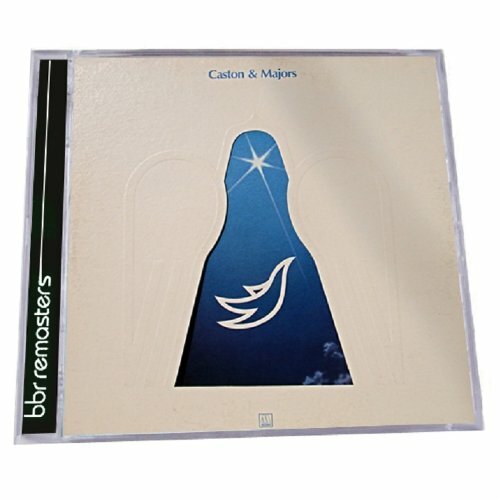 CASTON AND MAJORS-CASTON AND MAJORS. When Caston and Majors released their eponymous debut album in December 1974, it was very different from the music Motown had made their name releasing. This wasn’t the poppy soul that was referred to as The Sound Of Young America. Quite the opposite. Caston and Majors demonstrated how Motown’s music had slowly evolved over the past few years. Indeed, we need to go back five years to how Motown’s music started changing. The change in Motown’s sound can be traced back to 1969, when The Temptations moved towards psychedelia with their US R&B number one alum Puzzle People. Psychedelic Shack followed in 1970, and was the start of a change in Motown’s seventies sound. Then when Marvin Gaye released the seminal What’s Going On in 1971, this marked a change in direction for Marvin and Motown. Marvin replaced poppy soul with a much more mature, cerebral sound. 1972s Troubled Man and 1973s Let’s Got it On demonstrate this perfectly. Stevie Wonder was undergoing a similar transformation. No longer was he Little Stevie Wonder. Instead, from 1972s Music Of My Mind, Stevie Wonder reinvented himself as an artist. Albums like 1972s Talking Book and 1973s Innervision proving innovative and groundbreaking. Similarly progressive was Eddie Kendricks 1973 album Eddie Kendricks, which featured the proto-disco number one single Keep On Truckin.’ Working on that album were Frank Wilson and Leonard Caston, who had played their part in the changing Motown sound. For Leonard Caston, this would prove inspirational for his next project Caston and Majors. Leonard Caston was something of an institution at Motown by the time he released Caston and Majors, which will be rereleased by BBR Records on 25th March 2013. He’d been part of Motown’s pool of songwriters, session musicians and producers since 1968, when he left Chess Records. He’d worked alongside many of Motown’s most creative minds. This included Frank Wilson, one of Motown’s great songwriters and producers. Soon, Leonard was writing songs for The Four Tops, The Jackson Five and Eddie Kendricks. For Eddie Kendricks, he cowrote Girl You Need A Change of Mind, Boogie On Down and Keep On Truckin.’ However, Leonard wasn’t just a songwriter and producer, but a talent spotter. One of his latest musical discoveries was Carolyn Majors. While Carolyn Majors had been born in Greenville, South Carolina, she grew up in Detroit. When she was just sixteen, a family friend offered to introduce the musically talented Carolyn Majors to Berry Gordy. Carolyn had started singing in church, and by the time she was offered the introduction to Berry Gordy was a leading member of the Beverly Glenn Concert Chorale. Her father, a strictly religious man forbade this. Then five years later, she met Leonard Caston. He was making his way through Motown’s ranks. After their initial meeting in 1971, their friendship flourished. Soon they were involved in a relationship. Then when Motown asked Leonard to move to Los Angeles, Carolyn decided to move with him. By then Leonard’s responsibility and workload at Motown was increasing. Then in 1974, when Leonard and Carolyn released their debut album Caston and Majors, they were married. Not only did Caston and Majors mark the debut album of Leonard’s latest musical discovery, but his new wife Carolyn Majors. Would Caston and Majors prove as innovative and influential as the other albums that had help change Motown’s sound? For Caston and Majors, Leonard Caston and Kathy Wakefield cowrote the eight tracks on the album. By then, they’d established a reputation as a talented and successful songwriting partnership. Previously, they’d written The Supremes and Eddie Kendricks. This was the first album Leonard and Kathy had written together. The eight songs they cowrote became Caston and Majors. Recording of Caston and Majors took place in Motown Recording Studios in Los Angeles. Accompanying Caston and Majors were the Motown house band. This included a rhythm section of drummers Fred White, Earl Palmer, Kenneth Rich, Abraham Mills and Ed Greene, bassists James Jamerson and Henry Davis and guitarist Jay Graydon, while Ray Brown and Arni Egillson played upright bass. Percussion came courtesy of Alton Hendrickson on bongos, King Errisson on congas and Gary Coleman on vibes. Mike Melvoin, Larry Muhoberac and Leonard played keyboards and Syreeta Wright makes a guest appearance on Say You Love Me. Leonard Caston produced Caston and Majors, which was released was released in December 1974. On the release of Caston and Majors in December 1974, the album failed to chart. No singles were released in the US. Over in the UK, the lead single Child of Love Failed To Chart in February 1975. Caston and Majors was then released in March 1975, but again, failed to chart. Neither Sing released in June 1975, nor I’ll Keep My Light On released in September 1975, charted. Despite Leonard’s track record as a musician, songwriter and producer, Caston and Majors wasn’t a commercial success. Why was that? That’s what I’ll now tell you, when I tell you about Caston and Majors. Opening Caston and Majors is Child Of Love, which has a bold, dramatic folk pop take on the Motown shuffle. With thundering bongos, swathes of strings and gospel tinged lyrics, it’s a fiting way to introduce Carolyn Majors. Carolyn and Leonard deliver the lyrics with power, passion and sincerity. Together, they sing: “rise now, child of love, no time for wasting, rise now, child of love, stop hesitating.” The result is a powerful, spiritual fusion of gospel and soul with equal helpings of drama. Similarly dramatic is There’s Fear. It’s an examination of the uncertainties of life which everyone faces. Here, Carolyn delivers an impassioned solo, while percussion and the orchestral arrangement help the song reach its dramatic climax. Satisfied Mind (Sing) is quite different from what’s gone before. It draws its inspiration from a variety of sources and influences. The driving, pounding beat grabs your attention, before the arrangement looks back to the sixties. Folksy, mystical and even slightly psychedelic describes the arrangement. Think The Beatles circa 1967 and you’re getting there. Tinged with swathes of grandiose strings and harmonies, that are reminiscent of Godspell and other Broadway musicals, soon, a magical musical mystery tour unfolds. Carolyn’s vocals are crucial to the track. Through the sheer force of her personality she carries the track, harrying and encouraging, driving her backing vocalists and band to greater heights, as it reaches an emotive crescendo similar to You’ll Never Walk Alone from Rogers and Hammerstein’s Carousel. Say You Love Me Too has similar sound and influences. This includes psychedelia, Broadway musicals and folk music. A good reference point is The Turtles Happy Together, albeit with a Vaudevillian twist. Let There Be Love is another track where Caston and Majors return to their gospel sound. Having said that, the lyrics are powerful, moving and beautiful. They’re delivered against a slow, sprawling and orchestral arrangement, that’s been inspired by Broadway shows. When the vocals enters, emotion, belief and sincerity combine. Leonard, then Carolyn take charge of the vocal. She steals the show, her vocal a mixture of power, passion and spirituality. This allows Carolyn to step forward and demonstrate how talented and effective a vocalist she is. In doing this, she ensures everyone raises their game, playing their part in this deeply moving gospel-tinged song. It doesn’t take long to realize that I’ll Keep A Light In My Window is something special. Here, Carolyn and Leonard combine brilliantly. They drive each other to greater heights. It’s as if whatever Carolyn does, Leonard betters. Spurred on, she raises her game and lays down a challenge. Hope, heartache, emotion, passion and power are combined. Just as good is the arrangement. Like the vocals, it’s one of the best on Caston and Majors. No One Will Know is one of Caston and Majors’ highlights. Graceful and elegant, you wonder where the track is heading. Then doo wop harmonies enter, while Leonard unleashes his gospel-infused vocal. Things get even better when Beach Boys’ inspired harmonies enter. Unlike the original, the sugarcoated sound is replaced by something much more soulful and substantial. The addition of the lushest strings and meandering bass provide the finishing touches to this inspirational and uplifting track. Closing Caston and Majors is Everything Is All Right Now. Straight away, there’s a real Motown sound, albeit with a gospel twist. Leonard and Carolyn deliver alternate verses, with cooing harmonies for company. Good as Leonard’s vocal is, it’s Carolyn who casts a spell over you. She mixes power, confidence and soulfulness, as this uptempo slice of orchestral soul that ensures Caston and Majors closes on a deliciously soulful high. Earlier, I wondered why Caston and Majors hadn’t been a commercial success? Just like the commercial failure of any album, there are many possible explanations for this. Maybe Caston and Majors was released at the wrong time? Possibly people didn’t understand the music on Caston and Majors? After all, while gospel and soul were the two main influences on Caston and Majors, was tinged with pop, folk, Broadway musicals and sixties psychedelia. The other real possibility is that with its overt religious lyrics, people weren’t comfortable with the music? Then there’s musical fashion. In 1974, Philly Soul was King, with disco was growing in popularity. Gospel music was nowhere as popular as it had once been. It certainly was no longer a major musical genre. What people needed to do was approach Caston and Majors with an open mind. If they didn’t do this, then they may not have understood or “got” Caston and Majors. Sadly, Caston and Majors passed many people by. That’s a pity, as there were some good tracks on Caston and Majors. Let There Be Love, I’ll Keep A Light In My Window, No One Will Know and Everything Is All Right Now are the best tracks on Castors and Majors, which will be rereleased by BBR Records on 25th March 2013. As an added bonus, there are nine other tracks, which allow you to hear everything Castors and Majors ever recorded. Following Castors and Majors, there was no followup. Instead, Castors and Majors only album was their 1974 debut, where soul, gospel, folk, Broadway musicals and sixties psychedelia were poured into a musical melting pot and transformed into an intriguing, genre-sprawling album, that’s best described as innovative, like much of Motown’s early seventies releases. Standout Tracks: Let There Be Love, I’ll Keep A Light In My Window, No One Will Know and Everything Is All Right Now. ← ARTHUR PRYSOCK-ALL MY LIFE. I would add “Child of Love” to the list of best tracks. I bought the record on its release in ’74. A wonderfully produced and arranged song that hasn’t dated. Still love it. Two OF THE MOST BRILLIANT ARTISTS ever known! LEONARD CASTON, and the fabulous, incredible vocalist legends, I believe of all time CAROLYN CASTON.